If you must brake the vehicle with the parking brake, the braking distance is considerably longer and the wheels could lock. There is an increased danger of skidding and accidents. Only use the parking brake to brake the vehicle when the service brake is faulty. Do not apply the parking brake too firmly. If the wheels lock, release the parking brake until the wheels begin turning again. They could also operate the vehicle's equipment. There is a risk of an accident and injury. When you apply parking brake ; to brake the vehicle, the brake lamps do not light up. ► To apply: pull parking brake ; up firmly. Parking brake ; is applied. ► To release: depress the brake pedal and keep it depressed. ► Pull parking brake ; up firmly. 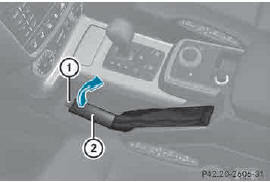 ► Press release button : on parking brake ; and move parking brake ; down to the stop. goes out in the instrument cluster. If you pull away with parking brake ; applied, a warning tone sounds.